Mr. S. Vijayakumar, Assistant Commissioner of Kendriya Vidyalaya Sangathan, Bangalore appreciated the work of Indian Development Foundation in TB awareness in different parts of the country. Kendriya Vidyalayas all over India should join hands with such noble cause and support the national programme, said Mr. Vijayakumar. Dr. S. Franklin, Manager-SR, IDF called on the Asst. Commissioner on 30/03 and presented TB awareness posters. Dr. Franklin expressed his gratitude to Mr. Vijayakumar and all the KVS team for all support given to IDF in connection with health awareness programmes. The students of St. Louis R.C. Middle School contributed Rs. 3,000 to the Indian Development Foundation, an NGO, for conducting various welfare activities and also for eradication of vulnerable diseases and poverty. The Principal, Sr. J. Maria Louis, presented the cheque to the Senior Field Officer of the foundation, Sam Deva Asir. He said that students play a crucial role in the development of the nation. The student who contributed the maximum was given a prize. Dr. H. Sudarshan, honorary secretary of Karuna Trust, was presented an award by the Public Health Foundation of India (PHFI) for his outstanding contribution and commitment to protecting the right to health of the vulnerable and less privileged communities, and his dedication to strengthening primary health care at the grass roots level with the aim of securing the fundamental needs of indigenous people. Speaking after receiving the award, Dr. Sudarshan said the success of primary health care in Karnataka had shown that diseases such as HIV/AIDS and mental disorders could be integrated with the primary health care, as could rehabilitation. In the Indian context, this could remove inequalities of class, gender and the marginalised sections. Good governance, he said, could transform outcomes as had been proved in Karnataka. INDIAN DEVELOPMENT FOUNDATION congratulates Dr. H. Sudarshan for winning the prestigious Award from Public Health Foundation of India for his outstanding contribution and commitment to protecting the right to health of the vulnerable and less privileged communities. IDF team admire and appreciate the excellent development work of Dr. Sudarshan and wish him best of luck in his ongoing projects. Incidentally, Dr. H. Sudarshan is one of the Trustees of IDF. Indian Development Foundation organised a TB awareness campaign at Bank of Baroda, Jogeshwari (East) branch on 26/03. Dr. A.R.K. Pillai, President of IDF spoke on the scientific information on TB and requested the office-bearers of Bank of Baroda to spread the message in the goodness of the society. Dr. Pillai said, early diagnosis and regular treatment can certainly help in reducing the number of TB cases in India. Every individual has the responsibility of disseminating the message of TB and bridge the gap of the patient and the medicines. TB is curable and diagnosis and treatment are given free at all DOTs centre, Dr.Pillai said. Mr. S. S. Panwar, Chief Manager of BOB appreciated the work of IDF in the area of TB awareness programme and exhorted his team to support the cause. 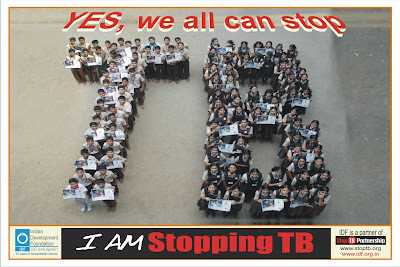 India's International Bank - Bank of Baroda supports TB cause. The boy in the picture is not the younger version Cinestar Chiranjeevi or Rajnikant, he is the Superstar of IDF. He is a wonder eight year kid. Meet G.R. Shankersai, IDF's young ambassador who created massive TB awareness programmes in Hyderabad and Secunderabad during this World TB Day. 17 schools/ 4 hospitals/ bus-stops/ secretariat/ govt health centre and various other of public places. Mindblowing to see the work of this little champ of IDF, isn't it ? 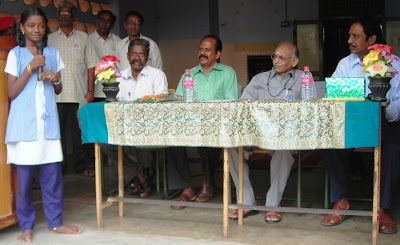 Shankersai also addressed a couple of groups at different places on TB awareness. He also visited Govt. TB hospital at Hyderabad and presented clothes to the inmates there. He advised the patients to take regular treatment and wished them a speedy recovery. IDF is proud of its littlechamp - Shankersai. Keep up the good work. Congrats and cheers !!! Indian Development Foundation organised a TB awareness programme at Indian Overseas Bank, Jogeshwari (East) Branch, Mumbai on 25/03. Dr. A.R.K. Pillai, President, IDF address the IOBians on the importance of social awareness and also explained to them the scientific facts about TB. IOBians came forward to support the national TB awareness programme. Mr. Santano D'souza, Chief Manager, and Mr. Parameshwaran, Manager, IOB appreciated the TB awareness programme carried out by IDF and appealed to the members to join hands with IDF in Stopping TB. Good people to grow with........says IOB. IDF appreciates the social responsibility initiative of Indian Overseas Bank in organising such programmes on TB awareness. Indian Development Foundation (IDF), along with Karnataka State T.B. 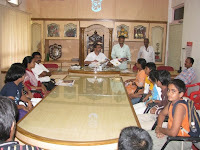 Association and Office of the Joint Director of Tuberculosis, organised various mass awareness campaigns, including an Essay contest for school students during World TB Day 2009. Thousands of students from all over Karnataka have participated in the contest. 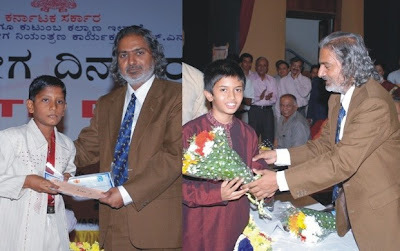 The best essays in the State and each district for both English and Kannada received prizes on the World TB Day function organised at Puttanna Chetty Town Hall, Bangalore on 24th March 2009. THE HINDU from Bangalore reported the event. Early detection of tuberculosis (TB) and regular follow-up of patients diagnosed with it are the important factors in eradicating the disease, Health and Family Welfare Secretary M. Madan Gopal said here on Tuesday. Speaking at a programme organised by the Karnataka State Tuberculosis Association and the State Health and Family Welfare Department, Mr. Madan Gopal said the disease could not be controlled despite concerted efforts by the Government because of ignorance and lack of cooperation from the patients and their family members. “There has been a tendency in some patients to discontinue the medicines after taking it for some time. It is necessary to educate the patients and their family members about the importance of getting treated,” he said. [*Master Manadeep, student of Warriors School, Challakere won the state level 1st prize in Kannada Essay writing competition. Pointing out that the role of health workers was vital in implementing the various Government health schemes, Mr. Madan Gopal called upon the workers to consider their work as a responsibility and not mere duty. Inaugurating the programme, Swami Japananda of Swami Vivekananda Comprehensive Rural Development Organisation, Pavagada, called upon the health department officials and workers to devote more time with the patients and listen to their problems. Posters to create awareness about the disease and clear misconceptions were released on the occasion. [*Dr. S. Franklin honoured by Mr. Nilay Mithash, IAS, Mission Director National Rural Health Mission. 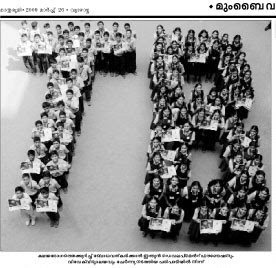 TB Day has been symbolically observed in Mangalore with kids from Centre for Integrated Learning (CIL) presenting a poster to the Mayor of Mangalore City Corporation Mr. Shankar Bhat. The mayor has assured the children that the posters would be stuck at important public places through the health department of the Corporation. The kids also went around the city sticking the posters in some of the main lanes of the city. College students from Mangalore Institute of Fashion Technology also participated in the TB awareness campaign by visiting small business establishments like hotels and shops in the vicinity of their college and spread awareness about the disease. The Post Graduate Department of Social Work of Karavali Group of Institutions will be organising a TB Awareness drive from March 25. The programme is being organised in association with Sameeksha Trust, an associate organisation of CIL. Apart from sticking the posters, the students have suggested that they will carry the message to their field work area where they are already working on Combat Malaria programme. TB awareness campaign was also carried out by the post graduate students of journalism at SDM College, Ujire near Dharmasthala by going around the town sticking posters. 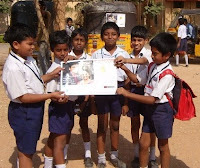 Indian Development Foundation provided the TB Awareness Posters to CIL for creating awareness in Mangalore area. IDF congratulates CIL team for organising wonderful social awareness programme. Indian Development Foundation organised TB Awareness programme at HDFC Bank, Jogeshwari (East) Branch on the World TB Day - 24/03. Dr. A.R.K. Pillai, President of IDF addressed the HDFC team and also the customers on scientific facts about TB. Ms. Swati Gaunekar, Branch Manager of the Bank appreciated the work of IDF and exhorted HDFC team to come forward and lend their support to the humanitarian programmes of IDF. Indian Development Foundation appreciates HDFC Bank for carrying out such meaningful social responsibility programme. TB AWARENESS IN FULL SWING. IDF TEAM REACHES MILLIONS. IDF thank Maharashtra State Road Transport Corporation (MSRTC) for allowing TB awareness posters to be displayed in every ST bus in Maharashtra. The engineering students from Vidyalankar Institute of Technology, Wadala, Mumbai joined hands with Indian Development Foundation to spread awareness on TB to the masses. Dr. A.R.K. Pillai and Dr. Narayan B. Iyer from IDF spoke to the students on scientific information of TB and exhorted the students to come forward in national interest. The students came together and received several TB awareness posters which they have promised to put up at important public points as part of World TB Day. Prof. Rupesh Gesota from VIT and Mr.Sanjay Waghmare and Mr. Jayaraja Acharya from IDF made necessary arrangements in organising the awareness programme. IF YOU NEED TO HELP SOMEONE WHO IS SUFFERING FROM TB & GUIDE HIM FOR TREATMENT TO THE NEAREST POINT IN YOUR AREA IN INDIA, CLICK THE LINK GIVEN BELOW. IDF young ambassador Shiloh Jessie Francisca from Rani Seethai Achi Hr. Sec. School, Annamalai University, Chidambaram was all happy to present sponsorship for about 50 students studying in IDF Bal Gurukuls in different parts India. If i can do it, why can't you ? Shiloh asks the people to get sensitized on social issues and come forward to support humanitarian programmes of IDF. I am thrilled to receive the autograph of the Cricket Legend Anil Kumble. My wish is to meet him and specially thank him for endorsing TB awareness message. Millions of people across India are receiving the message and we should all come together to stop the increase of disease. IDF team got special autograph for Shiloh when they met the cricket legend a couple of days ago. Mr. M. Rathina Sabapathi, Registrar of Annamalai University congratulated Shiloh for her splendid social performance. While thanking the Rani Seethai Schoolteam, Mr. C. Chidambaram and Mr. S. Sreeram from IDF appreciated the social responsibility of the young girl. IDF is proud to get an ambassador like Shiloh, the team said. May God bless you Shiloh. I congratulate the excellent work of Indian Development Foundation in the area of Tuberculosis awareness programme, said Mr. Ashish Ballal. Every individual should take up the responsibility and come forward to STOP TB. Olympian Arjuna Awardee and Asian Games Gold Medalist Mr. Ashish Ballal from Dhanraj Ballal Hockey Academy, Bangalore endorsed the message `I am stopping TB' during his visit to IDF Bangalore office on 16th March. Mr. Ashish Ballal accompannied by Mr. Ritesh Shetty and Mr. Manoj Shetty joined hands to support IDF's humanitarian programmes. IDF record its special thanks to Mr. Manoj Shetty and his friends for organising TB Awareness Posters for distribution to several thousands across the country. IDF Team comprising Dr. Narayan B. Iyer, Mr. Chidambaram and Dr. S. Franklin thanked Mr. Ashish, Mr. Ritesh and Mr. Manoj for extending support for the cause and presented TB Awareness posters. Indian Development Foundation is thankful to Mr.Roshan D'souza, Founder, Mangalorean.com for publishing IDF's new of meeting the Cricket Legend Anil Kumble in their newsportal. India is the world capital of TB and we should come together and stop it. We all can do it and let's come together, said Anil Kumble. Indian Development Foundation team comprising Dr. Narayan B. Iyer, Mr. C. Chidambaram, Dr. S. Franklin, Master Karan Dravid and Master Nishchith called on the cricket legend Anil Kumble at the National Cricket Academy, Bangalore on 16th March 2009. 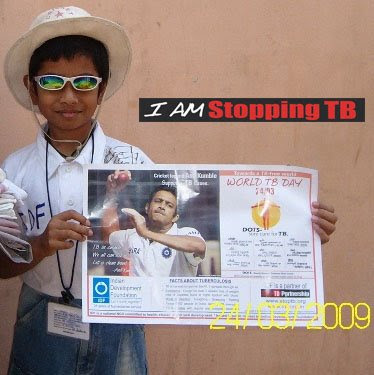 Anil Kumble endorsed the message for the World TB Day saying `Let's clean bowl TB'. He also endosed the message `I am stopping TB' when he met the IDF team. "It is the responsibility of every individual to come forward and support the cause. TB is rampant in India and we need to stop it at urgently. 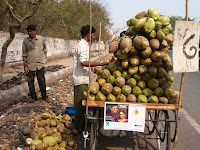 It is only possible by creating awareness in the society. Awareness is the key which can help in bridging the gap and getting cure to several lakhs of people who are suffering. I appreciate the good work of Indian Development Foundation in the area of Tuberculosis awareness programme, Anil Kumble said. Dr. Narayan B. Iyer, national co-ordinator of IDF explained the nation-wide awareness programme organised by IDF and also spreading the message through posters which are endorsed Anil Kumble. TB is curable and the treatment is available free at all DOTS centre in India. The role of government, public health centres and also NGOs need to be appreciated in the area of tuberculosis control programme. Dr. Narayan said, IDF is a proud partner of WHO's StopTB Partnership strengthening massive awareness in reaching out millions. IDF Southern Region Managers - Mr. Chidambaram and Dr. Franklin - explained the regional awareness activities carried out in southern India to control Tuberculosis. IDF managers said that the Foundation could reach several millions in India through TB awareness posters endorsed by Anil Kumble and Grandmaster Vishwanathan Anand. The team recorded special thanks to Mr. Manoj Shetty and his friends for organising thousands of awareness posters as their personal contribution to India's fight against TB. IDF young ambassadors - Karan Dravid (9) and Nischith (10) - were thrilled to meet the cricket legend. Karan and Nishchith narrated the successful social stories where their contributions helped in transforming se veral lives. Anil Kumble congratulated the young ambassadors of IDF and also the entire IDF team in spreaheading the tuberculosis awareness programme. Kumble also congratulated Dr. Narayan B. Iyer on being selected to represent IDF in the WHO's StopTB Partners Forum at Brazil during World TB Day. "World TB Day is on 24th March. "